Data is the new currency that runs the economy. It has completely transformed how customers do business. This new intelligence has enabled them to seize control of new opportunities from connecting and analyzing parts of their business that used to be disparate and in silos. But you can’t just plug in a bunch of Internet of Things (IoT) devices, connect them to a cloud platform and say, “mission accomplished.” For this telematics evolution to be more than just the next step, there needs to be tight integration between applications, devices, cloud platforms and back-end systems to make IoT data itself revolutionary. There is a way. And we at CalAmp call it The New How. It’s Connectivity, Real-Time Analytics and Data in Motion. The New How is about key tenets of our business that put us at the forefront of the connected vehicle economy and emerging Industrial Internet of Machines that help us drive success for our customers. 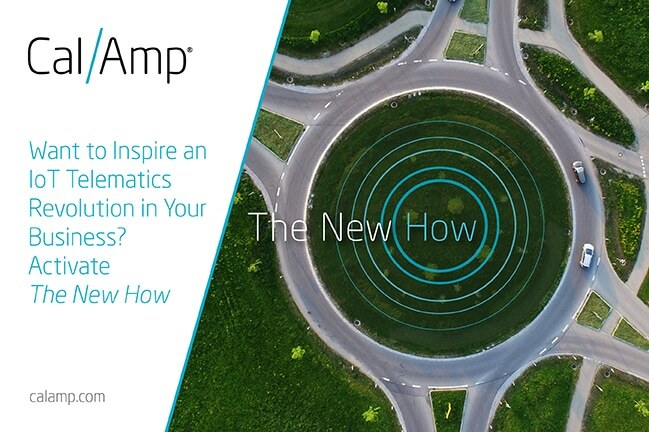 As a proven leader in machine-to-machine (M2M) communications with over three decades of expertise, CalAmp is in the unique position to analyze these disparate components, networks and points of connectivity. Through a wide range of customer engagements and experiences, more than 20 million device installments globally, and over 650,000 software and service subscribers, we’ve discovered how to eliminate the complexities of IoT deployments and help our customers streamline business operations. As the old saying goes, garbage in, garbage out. And when so many of our customers deal with data that affects the safety, efficiency and scale of operations, there cannot be any tolerance for inaccurate, incomplete or irrelevant data. Our scalable cloud platform, customizable applications and configurable telematics devices enable consistent, quality data capture across diverse settings. Our applications and intelligent devices can easily be managed and updated over the air as technology capabilities or business needs evolve. In a dynamic, IoT-driven world, it’s imperative to maintain data quality standards. We constantly deliver clean data that connects vehicles, cargo, companies, cities and people to provide insights that can inspire a new world of daring opportunities for an array of industries. If connected solutions can’t communicate and customers can’t easily interface with all devices at once, businesses will have no way of gleaning insight from their IoT investments. When it comes to devices, cloud platforms or telecommunications networks, the key to interoperability is about extracting only the necessary details of managing an object, asset, project, network or system. Our flexible Telematics Suite allows a wide variety of functional areas within a company, such as operations, supply chain and workforce management, to access only the desired information for each area of responsibility. And our programming and device management systems enable customers to design custom applications specific to their business through user-friendly application programming interfaces (APIs) and manage multiple device connections to mixed assets through one platform. There is no IoT revolution without scale. Organizations often struggle with scale after they deploy a large and diverse set of devices into their process. The answer to combat this is multi-carrier connectivity, fully programmable intelligence, and the flexibility and security offered by streamlined cloud integration. Our diverse range of industry leading applications, cloud services and advanced telematics devices enable construction companies and heavy equipment OEM manufacturers to pivot from managing unexpected downtime across mixed fleets to predictive maintenance and optimizing equipment utilization. It’s about automating vehicle crash reporting, repair and recovery to help fleet managers and insurers streamline the claims process while mitigating risk and reducing fraud across their entire fleet and policy holder base. It’s how multi-national firms prevent loss, maintain compliance and protect brand integrity with detailed visibility into their entire supply chain from the time it leaves manufacturing to arrival at a retailer or customer’s front door. These are intelligent, full stack IoT deployments that help businesses thrive. This is The New How for reliability at scale. The New How is more than just a philosophy. It’s an opportunity we’ve seen come to fruition time and again through our customers. From fleet transportation to insurance, construction to consumer goods, we’ve helped deliver industry-leading customized IoT solutions, clean data that transforms business operation, heterogeneous systems to streamline deployments and reliable implementations scale to manage business growth and technology evolution. Corporations with worldwide supply chain networks have turned to us for our expansive expertise, capitalizing on the The New How momentum to reinvent their business. It’s time for every business to get their own breakthrough, connecting vehicles, cargo, companies, cities and people to make their IoT data transformational. To learn more about The New How take a look at our video here.